This was a favorite recipe of mine growing up. These muffins definitely are delicious, slightly sweet, bite-sized treats! You might be tempted as I was to nibble on them on all day...! Preheat oven to 350 degrees F (175 degrees C). Grease 12 muffin cups or line cups with paper muffin liners. In a large bowl, whisk together flour, baking powder, salt, and nutmeg. In a separate bowl, cream together 1/2 cup sugar and shortening. Beat in egg. Stir flour mixture into shortening mixture alternately with milk. Beat well. Spoon batter into prepared muffin cups. Bake in preheated oven for 20 to 25 minutes. 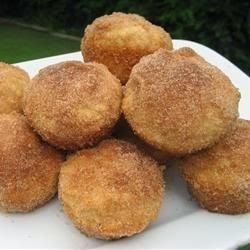 While muffins are baking, combine 1/2 cup sugar and 1 teaspoon cinnamon. Remove muffins from oven and muffin pan. Immediately, dip the tops of the muffins into the melted margarine, then into the sugar/cinnamon mixture. Repeat with each muffin, until all muffin tops are covered. Serve warm.